I had a friend lined up to help me this weekend at the Organic Expo, and she’s had a family emergency. This leaves me with a torn rotator cuff – a very sore shoulder for those of you who don’t know what a rotator cuff is – (remember not to run up stairs kids!) and the Organic Expo set up this Thursday and trading Friday, Saturday and Sunday! Just before you cue the violins, this is actually a show that I really enjoying doing. This is where I get to meet most of our customers face to face. And of course we get to spread the message. So, if you’re free on Thursday afternoon (set up), Friday, Saturday or Sunday and you want to come and play with me on the Queen B stand at the Organic Expo, please pop me an email. If it works as an incentive for you, if you come and help on Saturday that means your eligible to vote early which means you can avoid the queues and go to an early voting centre.! That’s a lot of text, so here’s a photograph of the amazing stand Joost did for us at the Organic Expo in Melbourne last year! Thankfully he gave me all the bits that I need to create an incredible stand in Sydney too. What you write always puts a smile on my face. Business is so competitive I love to read and see your passion for what you manufacture. I love your candles. What a good idea calling for volunteers – I cannot help you this time round. 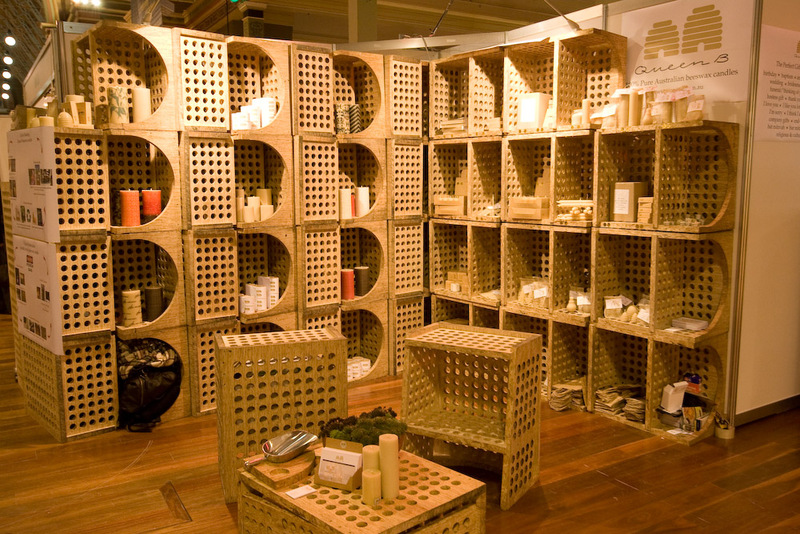 But next time your in Melbourne doing your ‘thing’ definitely – I could so hang out around the intoxicating smell of honey and beautifully designed stand. You must have a lovely life because people would always love your candles and your fun posts. I wish you prosperity. Thankyou for being who you are.